Five animal head posts were found in the Oseberg Viking ship grave dating back to the year 834 AD. The posts that originally were painted are made by different woodcarvers, and the researchers have no clear idea of what the works of art were used for. Today, four of the animal head posts are exhibited at the Viking Ship Museum at Bygdøy in Oslo. The last of the wooden carved posts was in a very bad condition and is safely stored in the museum. In 1904 when the Oseberg ship was excavated, two elderly women were found in a separate burial chamber just behind the Viking ship mast. The chamber was decorated with a stunningly woven tapestry and the two women were placed next to each other in a made bed. The burial took place during four months in the spring and summer in the year 834 AD, something archaeologists have been able to document through grave findings. The skeletons show that the oldest woman was between 70 and 80 years old when she died, probably from cancer. The other woman was younger and more than 50 years old, but the cause of death is unknown. The researchers are not sure who they were or what position they had in society. 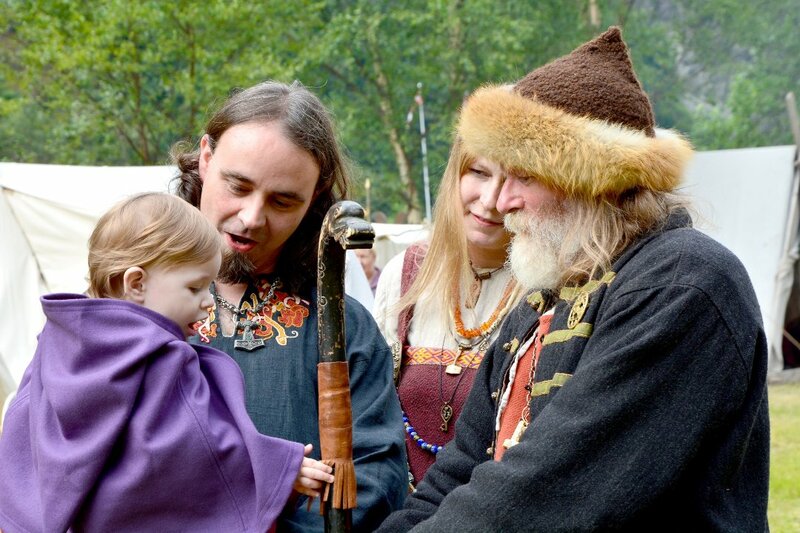 Some believe that the oldest woman was a powerful Völva sorceress and that the youngest woman might be a weaver or a close friend. But, these are just theories. No matter which theory that turns out to be correct, the Oseberg burial mound is the richest equipped Viking grave ever found, telling that these two ladies were really powerful women with great influence. Among hundreds of objects following the two ladies in their Afterlife, there were found three beautifully carved wooden horse sleighs, a work sleigh, one cart, seven beds (one with a chopped off bull’s head), fifteen horses, two tents, six dogs, one throne chair and a large amount of textiles. Four of the animal head posts were located in the burial chamber and one in the front of the Oseberg ship. They are about a half meter long (20 in) and on one of the animal heads there was attached an additional half meter long shaft. It looks as if the heads are made by different woodcarvers and two are decorated with silver rivets – and this type of posts is not known from any other graves dating back to the Viking Age. Some believe these are dog heads, in that case, some really scary Viking dogs. However, they may as well be depicting bears, or symbolizing animals from Old Norse mythology like Odin’s wolves, Freya’s cats or the Midgard Serpent. If the animal head posts were carried during processions, attached to the sledges or on a wall by the throne chair, just becomes speculation. Another interesting find is that one of the heads had a rope through the mouth. The rope was attached to some sort of rattle, or what some believe are forecasting rings. Five rattles were found in the Oseberg ship grave, and they have a clear connection with the animal head posts. This type of rattle is discovered in a few Viking Age graves. Some have bells and they are usually found together with a horse. The only thing certain when it comes to the use of the five animal head posts discovered in the most beautiful Viking ship in history, is that we are missing information to reveal the correct answer. For possible use as a staff head, see photo of viking village article below, where a reproduction is being held. The rattle looks like key rings, which had a symbolic value, the beast heads, some look reminiscent of cat heads, another symbolic link would be the cats associated with freyja, it may be worth reexamining the finds in a female symbological manner. I did not think of Freya’s cats – something that is as likely as that the posts are symbolizing dogs, Odin’s wolves or the Midgard Serpent. We simply do not know. Dogs seem like a fair assumption to me. The heads are very similar to the heads of canines, and not very similar to heads of any other animal. Of course it could still be the wolf or that special type of methaphorical snake that is called a dragon in some other cultures. But they do not really look like wolwes, they do actually look like dogs. At least to me, that is. Made by a master woodcarver any one of these would probably look like what they were supposed to look like, I am sure that woodwork like this was made with utmost care and attention. Compare to a painter, or some guy drawing. An unskilled creative might only be able to make a match-stick figure, while a professional would have the skills to make a photo-like portrait. These are clearly not works of a beginner carver; this kind of work requires solid experience. So, it would be fair to assume that whatever these heads look like is also what they were intended to look like. I have no opinion regarding their use. From the photos it is hard to get an impression of size – they appear as handles for something, but the word “pole” usually indicates something that is way to thick or large to be in need of a handle. My best guess is that the poles are the important part, and that these heads are just the ornament for the poles, making them look good since they have to be there anyway. This burial was not your common one, these two ladies would probably have deserved that even a support pole for a tent should be rigourously decorated by a master craftsman. Norway seems to have preserved the art of wood work and woodcarving best out of the Old Norse territories. Christian invaders there perhaps were not as eager to burn stuff as eg. in Denmark – or perhaps it owes to the fat that Denmark is basically a flat land you may run over easily while Norway has several areas that are harder to reach. In Denmark it seems that we have no woodcarvings or wood buildings left, or most anything else in the department of crafts, apart from a few stones that were not easily found or destroyed, some of those even made to order by Christians for Christians (eg the jelling rune stone, afaik, with old norse symbolism and all). They were hard on us, it appears that they tried seriously to exterminate us and demolish or appropriate every single part of our culture. I’m glad to see that so much heritage has survived in Norway.